The jewel in The Arts Club’s crown, The Penthouse Suite, offers Members and their guests truly exquisite accommodation. A spacious entrance hall leads into a separate, generously proportioned living room, a kitchen and dining area, and of course a bedroom of unparalleled comfort. Outside, the decked terrace overlooks the club’s pretty courtyard and leads up to a private roof terrace, complete with parasol and a dining table for up to 12 guests, offering you the possibility of private al fresco dining, cooked by our chefs, day or night. As with all our rooms, you can expect the finest Beltrami silk linen and towels, a lavish art deco marble bathroom complete with double vanities, a separate bath and shower and of course fresh flowers throughout. The 24 hour butler service and concierge team will ensure your every whim is answered swiftly. 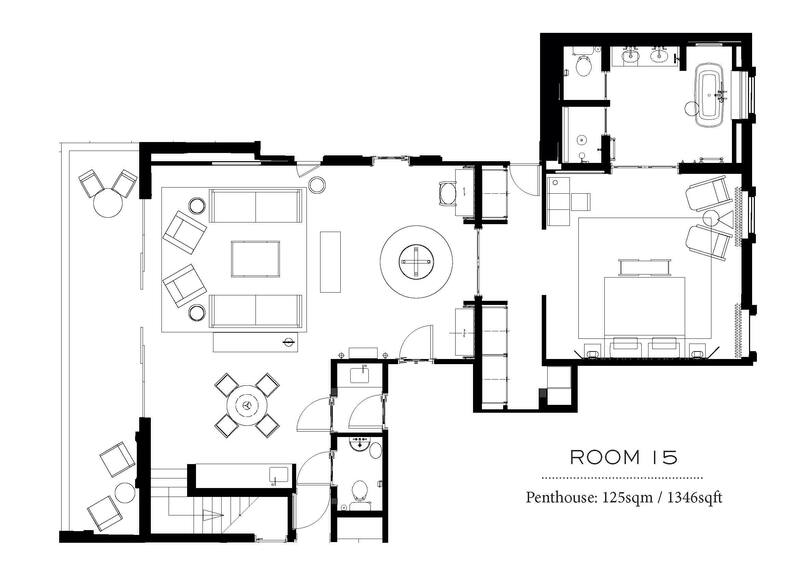 Click here to see The Penthouse floorplan. Terrace with decking, parasol and dining table for up to 12 people.